If you want to have fun and look good doing it, dungarees permit you to do both. These functional numbers are not low on style, but also make sure you look as cool as a cucumber. Dungarees can be traced back to the 1960s. The garment evolved from protective clothing for workers to a unisex fashion trend, that’s kinda considered timeless now. And now they are back in style and how. We give you an option to pick one, for less or more. Keep it simple and dapper with this fluid cotton dungaree. Pair it with a crop top or even a casual tee. We love that sweet little detail around the waist that gives a little peek-a-boo into what you are wearing underneath. Where : Buy it here. Love dungarees? How about wearing one that marries dhoti pants with the classic style. 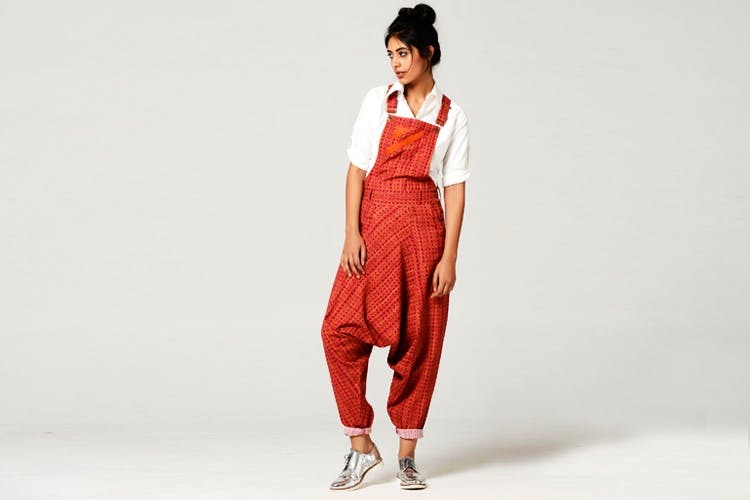 Enter Dhoti Dungarees by Madras-based company Brass Tacks. Made out of printed khadi cotton, this bright orange, roomy dungaree is our pick if you are looking to invest in a pair that will make quite the fashion splash.